Ottawa, 1 November 2016 – The Canadian HIV/AIDS Black, African & Caribbean Network (CHABAC) today released its newest fact sheet, “Emerging Prevention Technologies and Canada’s African, Caribbean and Black Communities”. 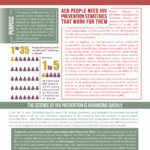 The HIV prevention landscape is constantly shifting and increasingly complex. 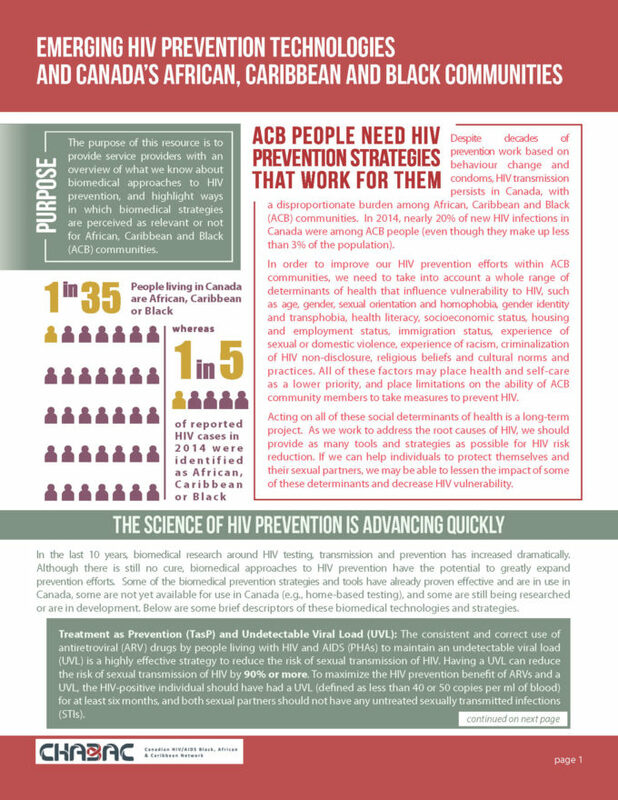 Today, there are more proven HIV prevention strategies, and growing knowledge about how to better understand and roll out these approaches in challenging contexts. Emerging prevention technologies, such as Pre-Exposure Prophylaxis (PrEP), have many potential benefits. However their uptake in African, Caribbean and Black communities has been slow, due in part to access issues. 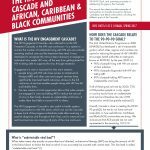 This fact sheet is the latest in a series of resources produced by CHABAC, highlighting key issues of relevance to organizations providing services that impact African, Caribbean and Black communities. These resources can be found at www.icad-cisd.com/chabac. 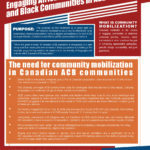 We hope you find this newest fact sheet useful and invite you to share your thoughts on the complex issue of emerging prevention technologies in Canada’s African, Caribbean and Black communities through the CHABAC listserv by emailing chabac@listserv.icad-cisd.com. If you are not a member of the listserv, you can join here. CHABAC was established in 2010. It is a national network of organizations, individuals and other stakeholders in Canada responding to HIV related issues in ACB communities. The network provides leadership in the national response to HIV identifies priorities for advocacy and facilitates information sharing on issues affecting ACB communities.  Additionally, the network coordinates national events such as the annual African, Caribbean and Black Canadian HIV/AIDS Awareness Day, which raises awareness and addresses HIV-related stigma in Canada’s African, Caribbean and Black communities.